For almost a half century the Dryden Flight Research Center, Edwards, California, has developed a unique and highly specialized capability for conducting flight research programs. The organization, made up of pilots, scientists, engineers, technicians, and mechanics, has been and will continue to be leaders in the field of advanced aeronautics. 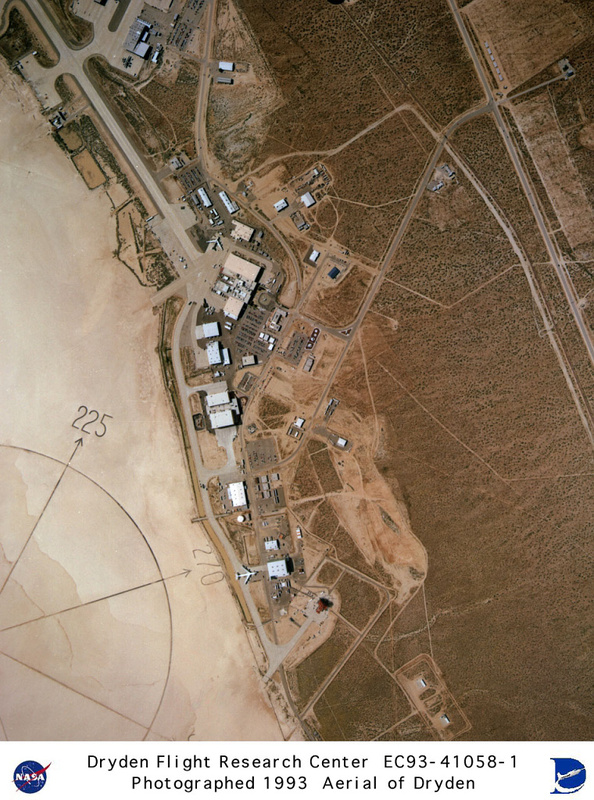 Located on the northwest "shore" of Rogers Dry Lake, the complex was built around the original administrative-hangar building constructed in 1954. Since then many additional support and operational facilities have been built including a number of unique test facilities such as the Thermalstructures Research Facility, Flow Visualization Facility, and the newest addition, the Integrated Test Facility. One of the most prominent structures is the space shuttle program's Mate-Demate Device and hangar in Area A (bottom center) to the north of the main complex. On the lakebed surface is a Compass Rose that gives pilots an instant compass heading. The Dryden complex originated at Edwards in support of the X-1 supersonic flight program. As other high-speed aircraft entered research programs, the facility became permanent and grew from a staff of five engineers in 1947 to a population 1995 of nearly 900 full-time government and contractor employees.